It was only two years after Nelson Mandela became South Africa's president that his predecessor officially apologized for the country's four decades of white supremacist government. F.W. 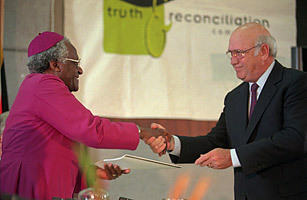 de Klerk, the last South African leader of the apartheid era, went before the country's Truth and Reconciliation Commission on August 21, 1996 (left) to apologize for 46 years of oppression, saying the racist policy was "deeply mistaken." De Klerk, who shared the 1993 Nobel Peace Prize with Mandela, eventually withdrew from the commission, saying he had no need to apply for amnesty as he hadn't committed any crime.